We have a lot to offer! Adaptive Riding, Healing through Horses, Educational Programs, and Occupational Therapy Fieldwork Opportunities. Meet our equine staff! Unicorn horses are exceptionally trained, quiet, capable and willing partners. Join us! 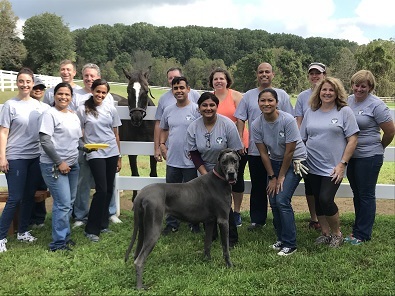 Help offer the wonderful benefits of therapeutic riding and equine activities to our community. You can help! Charitable donations are extremely important to our ability to serve disabled riders and their families. 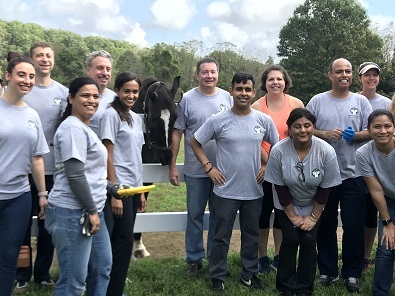 Unicorn welcomes volunteers from Merck Pharmaceutical who cleared trails and cleaned up barns.